Though colour science can be complex, our friends at Sawgrass have summarised some basic concepts which will help you achieve great colour output and repeat business. 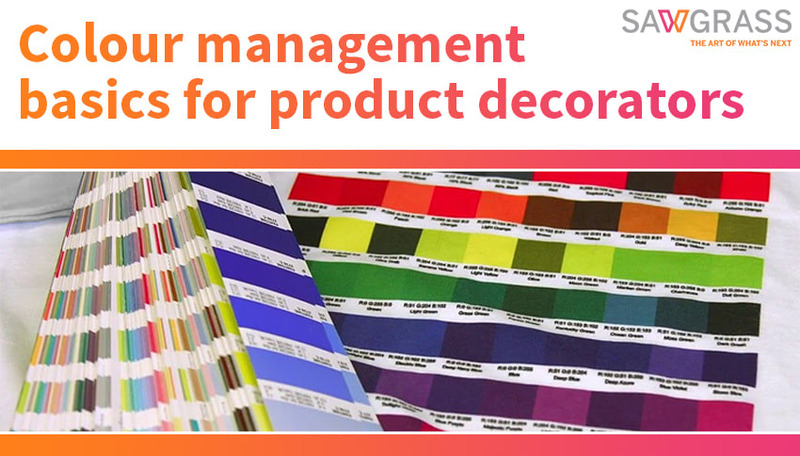 Colour is both an art and science when it comes to digital product decoration. The artistic part is creating the design to put on your product, while the scientific part of product decoration applies to the printing and heat pressing process. Understanding how colour works in a digital print environment is essential to success in this industry. The colours seen on your screen will never match the printed colours exactly. The reason for this disparity is because the colours on screens are generated by combining three colours: red, green and blue (RGB). Conversely, digital printers use anywhere from four to eight ink colours to reproduce the image from your screen. CMYK (cyan, magenta, yellow and black) is the standard for four-colour digital printing. Computer monitors emit colour as RGB light. Although all colours of the visible spectrum can be produced by merging red, green and blue light, monitors can display only a limited gamut (range of colour) of the visible spectrum. 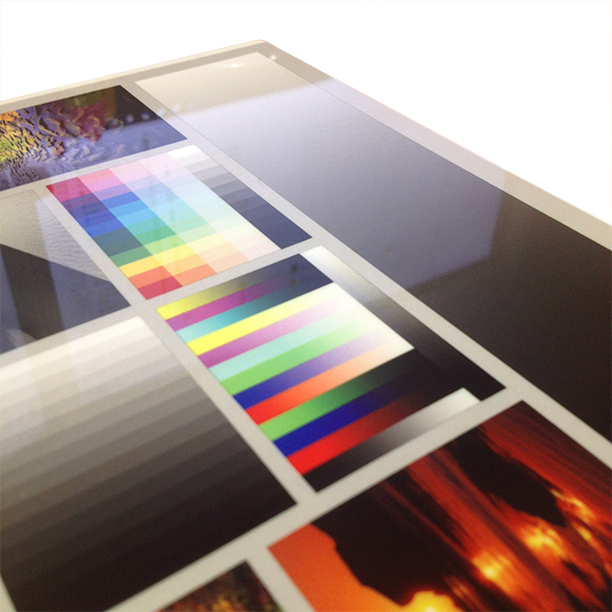 Printed products absorb or reflect specific wavelengths of light, unlike a screen that emits light. Cyan, magenta and yellow pigments or dyes serve as filters, subtracting varying degrees of red, green and blue from white light to produce a selective gamut of spectral colours. As you can see, there is marked difference between how both types of colour works. RGB is additive; CMYK is subtractive. In digital product decoration, designer work in an additive environment, and then the printer and software convert those colours to work in a subtractive environment. Colour management – or colour correction - is the process of adjusting this colour transformation so that you can produce the best quality results on your substrate. With dye sublimation, there is another element of the colour control process to point out. When a dye sublimation transfer sheet is pressed onto a substrate, the ink turns into a gas that bonds with the polymers of the substrate. During this “gassing” certain colours will slightly change, so the finished product will not look like the original image on the screen. You may also notice that colours of the ink printed on your transfer paper are very different from the final image created when heat and pressure is applied. This difference is because of the chemical characteristics of the dye sublimation process, and another reason why colour correction is needed. With sublimation, these issues need to be addressed for each individual printer and ink combination. In extreme circumstances, colour correction may be needed for every combination of printer /ink/substrate and transfer paper. However, extensive testing has shown that in most cases, good-quality transfer paper does not affect the final colour. Therefore, we recommend the use of only high-quality paper. Now that you understand the necessity of colour management for sublimation printing, let’s look at a few ways this is accomplished. An ICC (International Colour Consortium) profile is a set of data that attempts to create consistency between specific colours seen on the computer screen and those delivered on substrates. Think of an ICC profile as a colour-matching programme. A profile creates a link between specific screen colours and specific output colours. It doesn't change the colour, rather it ensures the correct output for a given input. To use this method, you must work with ICC compliant graphic software (e.g. Photoshop, Corel). The profile will be placed in the output stage of printing and the manufacturer’s (OEM) printer driver will be set to ‘No Colour Adjustment.’ This setup will allow the graphic software to colour correct the image and then send the data to the printer without the printer affecting the colours further. The process of creating ICC profiles from scratch is time consuming, requires a good understanding of colour science and is an art form in and of itself. Creating ICC profiles begins with printing a linearised colour pallet. A spectrophotometre is then used to measure the colours. From these data points, the software creates an algorithm that calculates the colour space and generates the ICC profile. Various types of images are then printed on a variety of substrates, and the profile is meticulously adjusted to optimise the final result. When a dye sublimation transfer is pressed onto a substrate, the ink turns into a gas, and while in this state, the colours change properties. The change in colour properties can be quite dramatic (e.g. some blues look like green on paper), and it is, therefore, impossible to judge whether the print is correct or not until it is sublimated onto the final substrate. 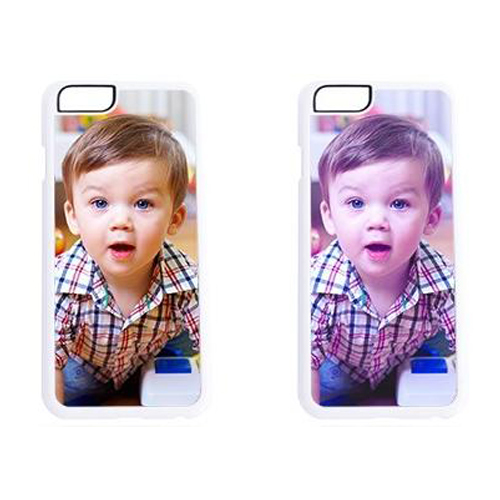 Therefore, it becomes necessary to create custom sublimation profiles and print management uses of these profiles to create the correct sublimated colour. Custom print drivers are programmes that have colour correction built into the printer control system. The advantage of these programme is that colour correction is performed at the printer driver stage, and they are generally easier and less technical to use than an ICC profile. 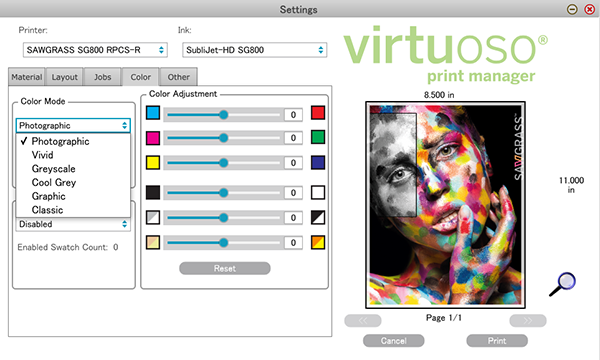 For Virtuoso HD Product Decorating Systems, Sawgrass offers Virtuoso Print Manager. It is our universal print management software for SG400, SG800 and VJ 628 printers. Virtuoso Print Manager makes achieving great colour output easy with CorelDraw, Adobe Photoshop, Adobe Illustrator, Silhouette and CreativeStudio™ design software for both Windows and Mac OS. The software’s integrated RIP-like tools help streamline production with an advanced array of features, including job and image nesting, hot folders with customizable pre-sets, multilingual user interface, file- and web-to-print workflows and more. Additionally, Virtuoso Print Manager enables you to select specific transfer papers, inks, colour modes and substrates, which the software will take into consideration while processing the file from RGB to CMYK. With these custom settings, getting the right colours are very easy. More sophisticated product decorators may choose to use Raster Image Processing (RIP) software, which includes ICC profile creation capabilities for managing colours. Simply put, RIPs convert images into individual dots (rasterizing) and sends these rasterized files to the printer. RIP software also handles workflow tasks, such as nesting images and batching or queuing files to print. RIPs are available from several software companies, including Wasatch and Ergosoft. Sawgrass recommends the use of Wasatch SoftRIP with the VJ 628 for users looking for a more sophisticated colour management and production solution. Each of the options discussed above have specific steps you must take to ensure the proper colour output. Get trained on how to use your colour management tool of choice correctly and make sure you do so with every print. For example, if you are printing a design from Photoshop, when you select the printer you choose Virtuoso Print Manager – NOT the SG400, SG800 or VJ 628 option that may be in your dropdown list. Doing so will open Virtuoso Print Manager, where you can make your selections for paper type, substrate, colour mode, etc. Most design software allows the colour mode for the design space to be specified and the choices are typically RGB or CMYK. We call this defining the colour space. When working with sublimation, you need to activate a specific RGB profile to produce accurate colours, unless working with a RIP, which uses CMYK. For example, many graphic artists design in CMYK colour mode because this is the most appropriate for commercial printing. Because sublimation requires RGB, these files need to be converted upon importing in to your design software. The reason for this is that sublimation profiles are built to convert RGB colours to CMYK output, not CMYK to CMYK (unless using a RIP, which works CMYK to CMYK). If you try to print a file that is CMYK, the conversion will not work correctly, and the colours will be off. Whether you are using an ICC profile or a custom printer driver, we suggest you create a colour chart by printing and sublimating an entire palette of colours to a pure white substrate. This creates a visual reference that you can refer to and show customers.The printed chart will show the exact colour that is created via sublimation (plus the RGB settings), so both you and your customer have an accurate reference when choosing the proper colours for the image being created. Though the colours may not look the same on the screen as they do on the final substrate, by choosing the desired colours from the chart, you are assured that the output will be a match each time, regardless of what is “displayed” on the computer monitor. Any change in any of the variables in the create, print and press process will impact your final output. These include substrates, sublimation paper selection, pressing time, temperature and pressure, as well as colour management techniques. It’s necessary to experiment and test as needed until you generate the desired results. Then, establish a set of standards to work by, with the full understanding that a change in the standards can lead to a change in the appearance and quality of the final product. There is much more to be said about colour management, but these basic concepts should help you gain a better understanding of what’s going on when you create, print and press – and how to get the colours you want.